France Marien and her fitness company, Remix Workouts, have the privilege of offering the Brian Grant Power Forward Boot Camp. 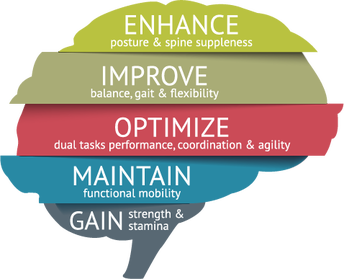 Developed by the Brian Grant Foundation, the Power Forward Boot Camp is based on increasing evidence and research that show the benefits of exercise to counteract Parkinson’s symptoms. This high-intensity fitness class is designed for those in the early stages of Parkinson's. ​dual task exercises. Come and lift, stretch, squat, twist, lunge and play ParkinSportsTM with us! Fill out this Balance Confidence Survey (only Remix Workouts will see your answers). For each of the following activities, please indicate your level of confidence in doing the activity without losing your balance or becoming unsteady by choosing one of the percentage points on a scale from 0% (no confidence) to 100% (completely confident). If you do not currently do the activity in question, try to imagine how confident you would be if you had to do the activity. A. Walk around the house? B. Walk up or down stairs? C. Bend over and pick up something from the floor? D. Reach for a small can from a shelf at eye level? E. Stand on your tiptoes and reach for something above your head? F. Stand on a chair and reach for something? I. Get into or out of a car? J. Walk across a parking lot to a mall? K. Walk up or down a ramp? L. Walk in a crowded mall where people rapidly walk past you? M. Are bumped into by people as you walk through the mall? N. Step onto or off of an escalator as you're holding onto a railing? O. Step onto or off an escalator without holding onto a railing? P. Walk outside on icy sidewalks? After completion of the Balance Confidence Survey, you will receive an email from Remix Workouts (info@remixworkouts.com) including a questionnaire and instructions on scheduling an in-person meeting. After evaluation, Remix Workouts will let you know if this Boot Camp class is the right fit for you. Don’t be intimidated by the multiple steps, this class will be worth it. 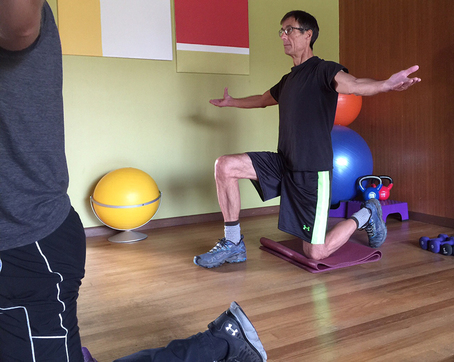 Tim, who was diagnosed with Parkinson’s disease in 2015, is preparing to perform a kneeling balance exercise. After screening process, join us for a FREE tryout class! ***All participants need to have gone through the screening process. Cash or check payable to Remix Workouts. If you prefer a more personal setting, we also offer ﻿one-on-one classes﻿. Bring a yoga mat and a water bottle. READ ABOUT YOUR INSTRUCTOR: France Marien.